Royal Southern Yacht Club unveils new Champion of Champions Trophy sponsored by Barbados Tourism Marketing Inc. Launched in 2012 as part of the Royal Southern Yacht Club’s 175th Anniversary celebrations, this year marks the 5th year in which the Hamble-based Yacht Club and Barbados Tourism Marketing Inc. have united to recognise the prestigious annual Champion of Champions award. To mark this, Barbados Tourism Marketing Inc. has kindly provided a Champion of Champions Trophy to be presented annually. This prestigious title together with its generous prize of a return trip for two to Barbados, including superior hotel accommodation at the Island Inn Hotel from 16th Jan-23rd January, also allows the winners to take part in the Barbados Week sailing events. The highlight is the 60nm Mount Gay Round Barbados Race and all this courtesy of Barbados Tourism Marketing Inc. and the Barbados Cruising Club, and bestowed upon the owner of the most consistent and successful yacht in the Club’s four Summer Series Regattas held in May, June, July & September. Images: Mike Blair’s King 40 Cobra (Paul Wyeth) and the new Champion of Champions Trophy, just awaiting the inscriptions. This year’s winners, previously announced after the Barbados September Regatta as Mike & Seb Blair (King 40 Cobra, competing in IRC 1), will be presented with the 2016 Champion of Champions Trophy at the Royal Southern Yacht Club’s annual Prizegiving, a formal dinner and glittering celebration held at their riverside Club House in Hamble on Saturday November 12th. The Trophy is currently being engraved with the previous winners’ names as well as the names of this year’s winners, and will be presented on the night by Marc McCollin on behalf of Barbados Tourism Marketing Inc.
Bart’s Bash 2016, the mass participation and fundraising sailing event held earlier this month (17-18 September) in aid of the Andrew Simpson Sailing Foundation (ASSF), has been voted a resounding success by organisers and participants alike, especially in terms of expanding the interest in disabled sailing and extending this unique event’s reach around the world. In relation to the fundraising, many of the 362 clubs and sailing venues in 58 countries hosting Bart’s Bash events are still collecting money and some participants are still receiving donations through their Justgiving pages so the final fundraising amount will still take a few days to compute! The charitable donation element is a crucial part of the equation as the Foundation’s main objective from this third year of Bart’s Bash is about raising awareness and funds to support disabled sailing around the world. Richard Percy, CEO of the ASSF is also quick to point out that the emphasis during the weekend’s Bash is on fun, engagement and encouraging more people, especially youngsters, to take to the water in memory of Andrew ‘Bart’ Simpson, wherever they happen to be in the world. “In the space of two days, we have witnessed international support from thousands of people in 362 venues across 58 countries. We have had Olympic sailors and America’s Cup sailors competing against youngsters who have just learnt to sail and those who race on a regular basis at club level. This event captures the imagination of people from inside and outside of the sailing world. The weekend’s event was also generously supported by members of the British Sailing Team, some just back from Rio and sporting Olympic medals! Giles Scott, Saskia Clark & Hannah Mills and Nick Dempsey were joined by Luke Patience and Dylan Fletcher, amongst others who were racing at the HQ at the Weymouth & Portland Sailing Academy (WPNSA), UK, where the Andrew Simpson Sailing Centre (ASSC) is based, sailing in an assortment of boats! So, make sure you put next year’s Bart’s Bash weekend dates in your diaries now! September 16th -17th 2017. Question: How do you cram all the different racing scenarios that you might encounter over a season into one day on the water? Answer: Go 2K Team Racing at the Royal Southern…and they did! ‘2K’ is defined as two boat team racing in keel boats, with mixed gender crews and no spinnakers. Team racing provides short, high intensity races with lots of close quarter encounters between boats. The RSrnYC held this new training event, organised by Dr Stephanie Merry, during this weekend, sailing in the Club’s Academy fleet of J/80s. Members were invited to form mixed gender crews of four people to take part. Each crew of four were paired at random with another crew of four, to form a two-boat team for the first round of racing. This was to ensure that the teams are well matched. Each two-boat team raced against the other teams in the first round and in the second round, there was a new set of random pairs. Bruce Hebbert, who created 2K Team Racing and its new European circuit, started off the event with a talk about 2K tactics on the evening of Friday 1st April in the Club house. Boats then left the dock at 09.00 on Saturday 2nd April to participate in short, sharp races of around 15 minutes each, with regular changes of crew on the boats between races. Bruce and Nick Rusbridge were the on-water umpires and also provided lots of feedback between races. Steph Merry passed on her thanks to the Commodore Chris Mansfield for ferrying members between the J/80s and Barry and Ann Peddley for providing the Committee Boat. 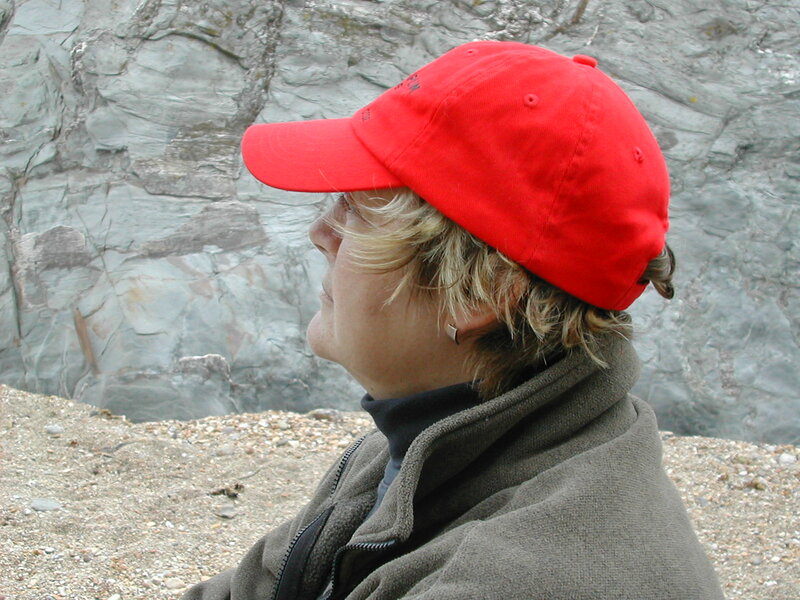 She also said that Henry Rochford, the new assistant to Tim Thubron in the Sailing Office, deserved a special mention for doing an excellent job of organising the boats, equipment and paperwork. Not bad for his first event! The winning team, announced during post-race drinks at the bar, was captained by Phil Meakins with Ann Wilkinson, Richard Patrick and John Kickham (a newcomer to team racing) in his crew. In 2nd was Ian Armstrong, with a crew of novice team racers, Kate Sawbridge, Fiona Cotterill and Richard White. The “Commodore’s Cadets”, skippered by the Commodore’s son Ben Mansfield, came 3rd. The ultimate aim of this training event is for a team or teams from the RSrnYC to participate in the 2K European Tour, which takes place in 11 different countries during 2016. The 3rd placed Commodore’s Cadets head for the Club after racing. K2 Team Racing in Athens last month. Sailing Club Manager (SCM) is a user-friendly online club and membership management tool for UK sailing clubs, yacht clubs and class associations of any size. This includes all clubs ranging from small volunteer-run clubs on inland lakes and waterways to larger clubs with full time managers, permanent and seasonal staff. Being in the business of helping Clubs communicate with existing members and with potential members it is great to see SCM now starting to be adopted by clubs around the world. 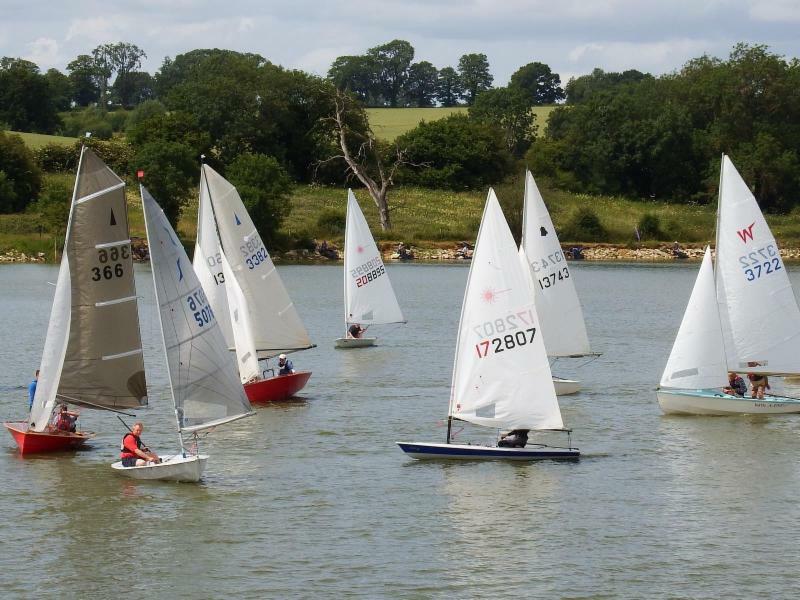 Closer to home, Banbury Sailing Club is located at Boddington Reservoir, near Byfield, Northamptonshire but which also draws sailors from Oxfordshire and Warwickshire. 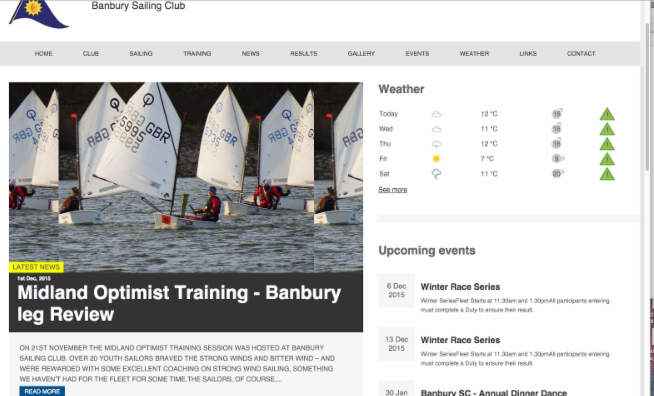 Banbury SC website: a clean, modern interface for the Club and its members. 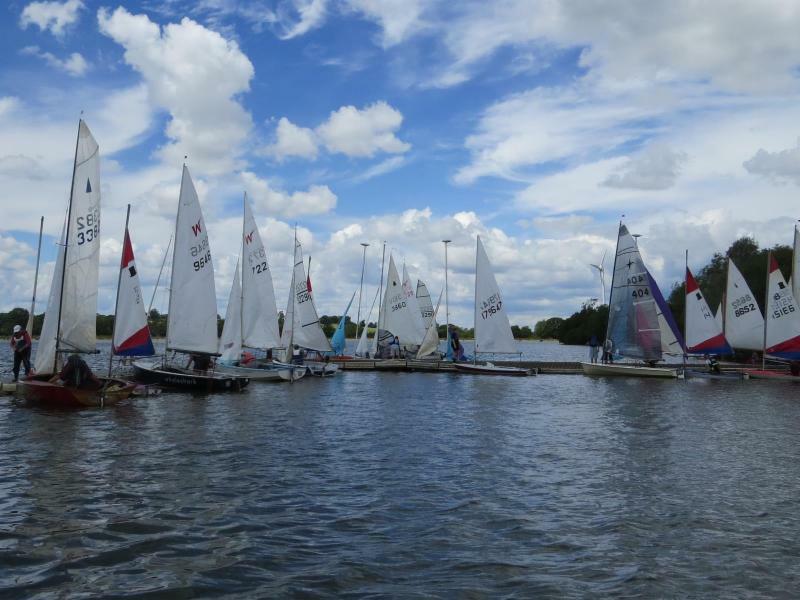 Banbury Sailing Club was managing the running of the club using a combination of software products including spreadsheets, personal e-mail accounts, a WordPress website and the specialist software “Dutyman”. This Club, as with so many sailing clubs, is run by volunteers and the workload to tie everything up between these systems was increasing – as were the expectations of the members. Sailing Club Manager has not only fulfilled the Club’s needs to reduce overall administration time, but it has exceeded expectations in ways they had not considered. Having records of both current and past members in the system, has enabled the Club to have accurate and up to the minute reports on its membership and means thery can still keep in touch with those members who (for whatever reason) haven’t renewed their membership, should they still wish. SCM is helping the Club communicate more efficiently & effectively with its wide-ranging membership about all its activities both on & off the water. The mailings to members has ‘professionalised’ the Club’s communication to its membership and they can quickly view how many people have seen the important communications they have sent out. The Club’s website allows for all club activities to be seen and for people to book events direct – no more illegible names scribbled on a sheet at the sailing club! The duty system, linked to the membership database, means they can swiftly and easily loop new members into the duty rota. Banbury SC’s Youth section is using the event management processes to understand expected numbers to each session (through bookings) and to manage the attendance of the right number of instructors (through the duty rota). This allows the organisers to know how many boats to get ready and how many instructors are needed, i.e. not over (or under) staffing and they don’t need to send anyone away on the day – this is particularly important as they draw their membership (inc instructors) from a wide travel radius. The Sailing Club Manager system has additional functionality that wasn’t originally required, including boat park management, race / event administration, racing results and online payment of invoices. 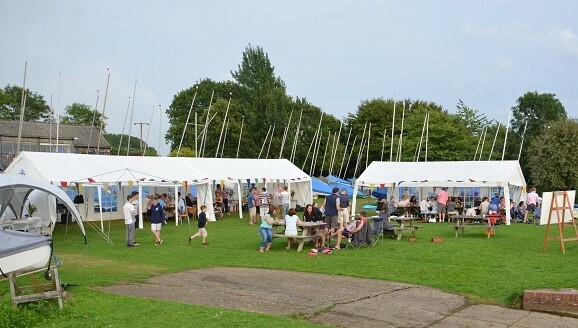 “The more of these ‘out of the box’ functions we use, the more benefit we get out of the system and so Sailing Club Manager is becoming invaluable to the running of the Club,” comments Syme. Plaudits & a stunning array of trophies were awarded – including the ‘Champion of Champions’ prize – at the Royal Southern Yacht Club’s annual Prizegiving held on Saturday 14th November. The Royal Southern Yacht Club and its membership have enjoyed a truly outstanding year of success both in UK waters and on the world’s sailing stage. The Club’s packed on-water programme has combined top quality racing and superb cruising for sailing and motor boating members, with some terrific results being gained across the board. Added to this intoxicating mix was the commissioning of the Prince Philip Yacht Haven by its Patron, HRH The Duke of Edinburgh in June, providing a first-class facility and lasting legacy for members, visiting yachtsmen and the Hamble community. Following a sumptuous three course dinner provided courtesy of the Club and enjoyed by 145 guests, the annual Prizegiving commenced under the stewardship of the Rear Commodore Sailing Graham Nixon, accompanied by the evening’s special guest, Libby Greenhalgh, the navigator on Team SCA in the Volvo Ocean Race, handing out the prizes. There are over 100 trophies and awards and in a fitting opener to the presentations, it was Cadet, Youth and Academy members being recognised first. Trophies went to Ben Childerley, Charles Handley, Finlay Craigen and Chris James. Finlay Craigen with Libby Greenhalgh. The Junior Cadet and Optimist sailor Isabelle Waha was the recipient of the inaugural Richard Cann Trophy, presented by Richard’s parents in his memory. Richard was a member of the Club from the age of 12, but very sadly passed away last year. Kate & Chris Cann with Chris James collecting the Trophy on behalf of Isabelle Waha. British Sailing Team member Hannah Diamond was awarded the Morning Flight Trophy for an outstanding performance in double-handed racing in the Nacra 17. Hannah is currently in Rio preparing for December’s Copa do Brasil, the last regatta in the Olympic venue before the games next year. Special prizes also went to Annabel Vose and Nikki Curwen. Annabel’s in recognition of her outstanding performance this year, winning the Women’s World Youth Match Racing championship, the Student Yachting Worlds; she was a semi-finalist at the Eurosaf & ISAF Youth Worlds, as well as being a member of the first all-female crew in this year’s Rolex Fastnet Race, sailing Concise 2 in the Fast 40 class. Nikki qualified for this year’s Mini Transat and is currently mid-Atlantic, en-route to Guadeloupe in her Classe Mini 6.5m. Both are products of the Royal Southern’s youth development and Academy programmes. The Royal Southern’s Summer Series Regattas are perhaps the most hotly contested of all the Club events and the prestigious ‘Champion of Champions’ title was once again up for grabs this year. The ‘Champion of Champions’ award honours performance and consistency across all the classes of yacht that compete in the Royal Southern Yacht Club Summer Series. Annie and Andy’s win was greeted with cheers and applause as the couple were clearly completely taken by surprise as they became engaged only three weeks ago and are planning to get married next September. The Club celebrated its 175th Anniversary in 2012. The Royal Southern, whose Patron is HRH The Prince Philip Duke of Edinburgh K.G. K.T., is one of Europe’s premier yacht racing organisers, excelling at all levels of competition and enjoying the practical experience of internationally qualified race officers amongst its members. 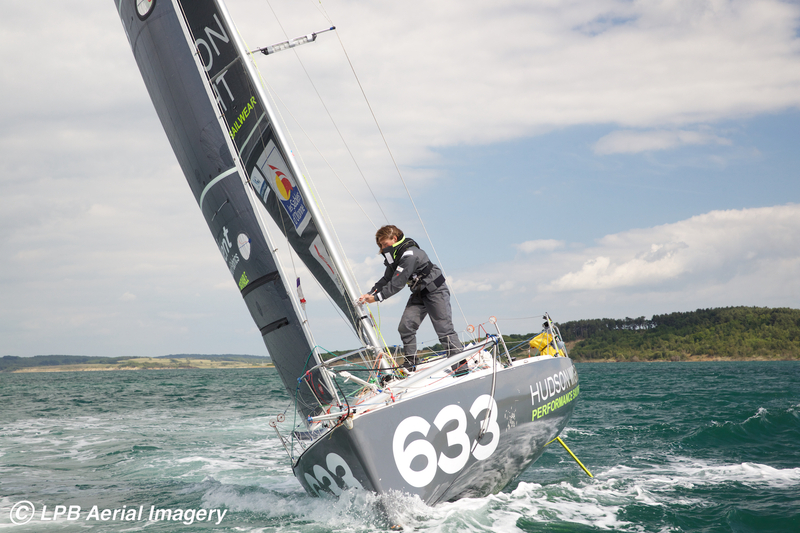 Many of the Club’s sailing members have achieved notable successes on the international stage, from world champions in dinghies and keelboats to the twice winner of the classic Rolex Fastnet Race. Quadruple Olympic Gold and Silver Medallist, & America’s Cup winning sailor Sir Ben Ainslie, and single-handed circumnavigators, Samantha Davies, Sir Chay Blyth and Sir Robin Knox-Johnston are all Honorary Members as is disabled yachtsman and disability sports ambassador Geoff Holt and Paralympic medallist Helena Lucas. The latest name to be added to this distinguished Honorary Membership list is that of Ian Williams, 5 x World Match Racing Champion. The Prince Philip Yacht Haven was commissioned by the Club’s Patron, HRH The Duke of Edinburgh, on 4th June 2015. This was the culmination of a project that started 14 years ago. The Club has a proud and illustrious history in the sport and an active membership in excess of 1700 adults and 140 Academy members. 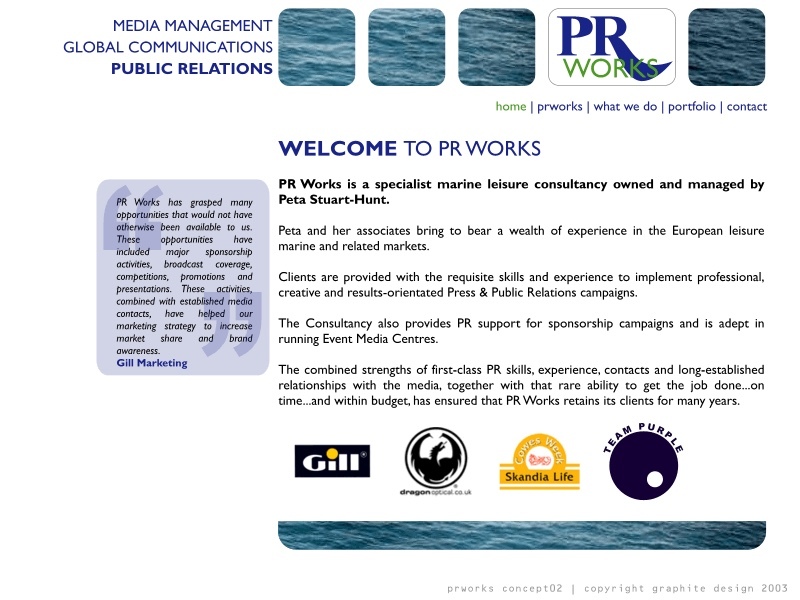 Twenty-two years ago today I launched PR Works. I’m feeling very proud to still be in business having worked away, on my own, all these years happily achieving a very eventful but pretty good work/life balance! Thank you to all the lovely people, friends, industry colleagues, media and clients who have supported me along the way. I looked at my profile on Linkedin the other day and it really hit home that I have been extremely fortunate to work with some of the best names in the business and count many of them amongst my friends. Right: A page from my original website! 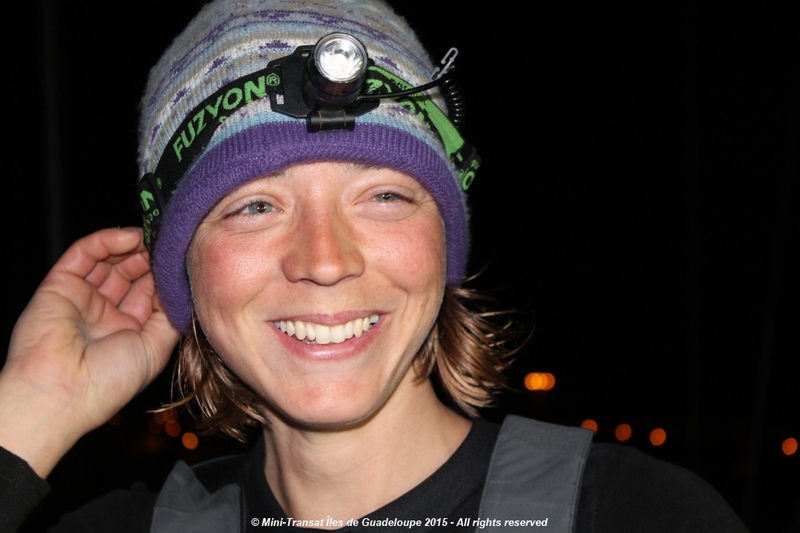 Peta Stuart-Hunt chats with the 25 year-old British solo sailor Lizzy Foreman before she sets sail on the final 2,770nm leg of the Mini Transat Iles de Guadeloupe to Guadeloupe on 31st October in ‘Hudson Wight’, Hull 633, a 10-year old Series Mini 6.50m. Her flight to Paris is booked for 29th November, so she’s feeling reasonably confident! LF: The stopover has been long for sure and when I leave Lanzarote my priority is to crack the hardest tactical point of the race, getting into the trade winds – much of the overall result of this race is going to be about getting in to these winds ASAP. The fleet will have to decide the best route to take leaving the Canary Islands (considering wind acceleration affects and the position of any low pressures), and then pick the best route around any low pressures we experience along the way. The good bits were really great. Although the boat isn’t comfortable the addition of a padded seat on the rail made a huge difference and prevented any backaches. I love small, cosy places. There isn’t much space to sleep and I was often wedged in with my bags of food. My MP3 player broke and so did the boat’s speaker, so luckily Mum has bought me a new player and I’ll just listen to music on my headphones. This time I’m taking a book too. PSH: What’s your biggest worry setting off on Saturday? LF: To be honest my worst nightmare is breaking something major like the mast or keel; but I’m most nervous about making a silly strategic error and finishing later than everybody else. The only upside being a good welcome on the pontoon! I’m really looking forward to getting going again. We’ve been here for a month and eventually you start to feel nervous and stressed about what’s going to happen next. I need to get into those trade winds and let everything settle. From Lanzarote the competitors will pick up the trade winds, with the opportunity for a high speed sleigh ride across the Atlantic to show off the exceptional planing qualities of their designs, before the fleet arrives, all colours blazing, at the finish line in Pointe à Pitre, the capital of Guadeloupe. Saturday, November 28th – the finish line closes.